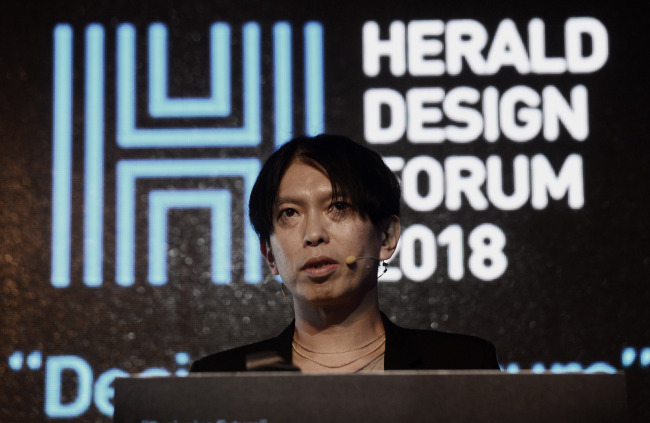 “Through my architecture, I try to create not just a new space, but a new landscape,” he said at the Herald Design Forum 2018 held at Dongdaemun Design Plaza in Seoul on Saturday. Ishigami introduced his glass pavilion for Park Groot Vijversburg -- a wavy, elegant-looking pavilion sided by glass windows, without columns -- located inside an old garden estate in the Netherlands. The rising architect explained another of his works -- a cave-like restaurant in Yamaguchi, Japan. He used a burrowing construction technique -- digging holes in the ground, filling them with concrete and burrowing out the soil around them -- to build the structure, which resembles a beehive with curvy columns, evoking Antoni Gaudi’s surreal, sinuous structures. “Spawning a landscape that didn’t previously exist in nature, but one that exists somewhere between nature and artifice, has been the interweaving theme of my works,” he said. Although many architects easily resort to nature metaphors, Ishigami has been a real creator of imaginative spaces, thoroughly imbuing them with designs and motifs borrowed from nature. In another project, he created an artificial forest -- by transplanting an entire forest, tree by tree, onto a nearby farmland -- replete with moss-covered ponds, all part of a hotel compound. Ishigami’s works range from a renovated museum in Moscow to a monumental arch in Sydney. Ishigami was the winner of the Golden Lion award at the 12th Venice Architecture Biennale in 2010, and the youngest ever recipient of the Architectural Institute of Japan Prize for the Kanagawa Institute of Technology KAIT Workshop in 2009. In 2016, he won the fifth BSI Swiss Architectural Award. From 2000 through 2004, he worked under Pritzker Architecture Prize winner Kazuyo Sejima, before establishing his own firm, junya.ishigami+associates, in 2004.